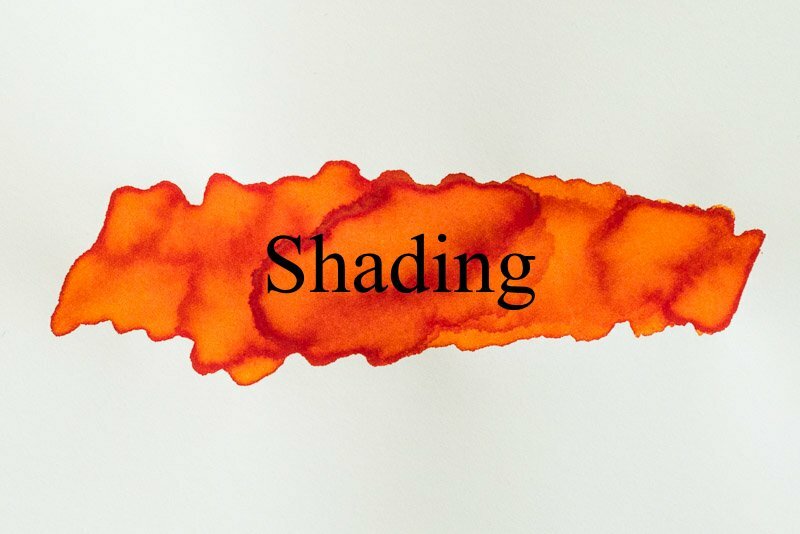 One of the most basic and recognizable characteristics a fountain pen ink can have is shading. 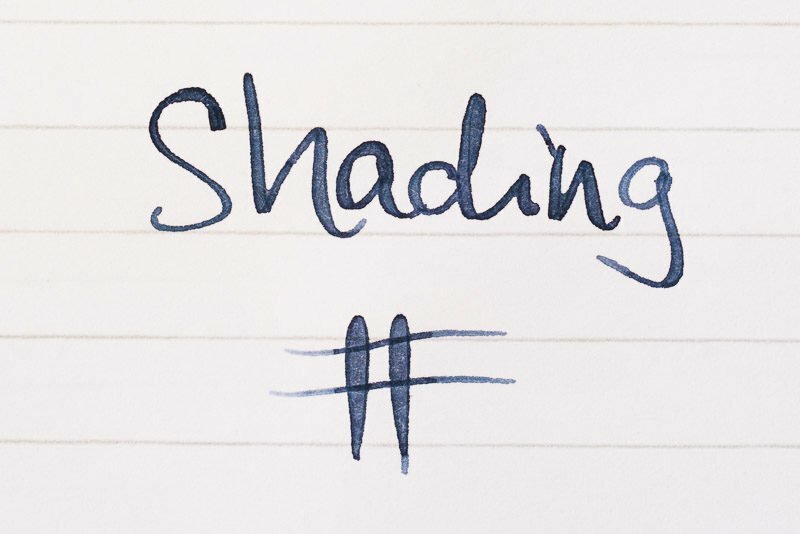 Shading can give your handwriting a great deal of character, regardless of which color of ink or style of nib you use. In this article I’ll explain what fountain pen ink shading is, show you some examples so you’ll know what it looks like and give you some tips to get shading in your writing. You can see that some letters are much darker than others. 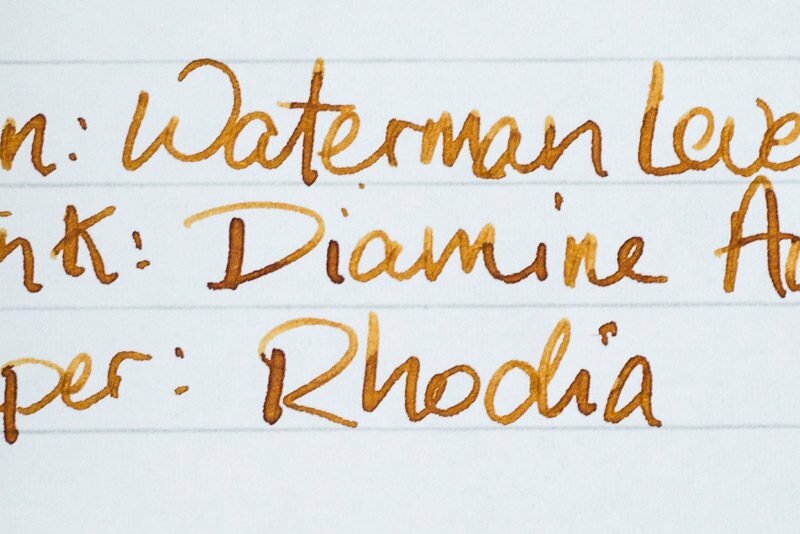 For example, the “ia” in “Rhodia” are much darker than the “d” in the same word. It’s not only the individual letters that are darker, it’s also different parts of the same letters! You can see the “Rh” in “Rhodia” are lighter on the top than on the bottom. These are both examples of ink shading. This type of shading might not appeal to everyone. You might find it distracting to have such abrupt shading transitions in your writing. If that’s the case, let me show you another type of shading that you might find more appealing. This type of shading is much more subtle and gradual. In this image, you can see that there are no abrupt color transitions between letters. Instead, there are very gradual shading transitions between the edges and centers of the letters. This tends to happen when you use a broad or flexible nib that shows a distinct separation between the edge and middle of your writing. How Do You Get Ink Shading? 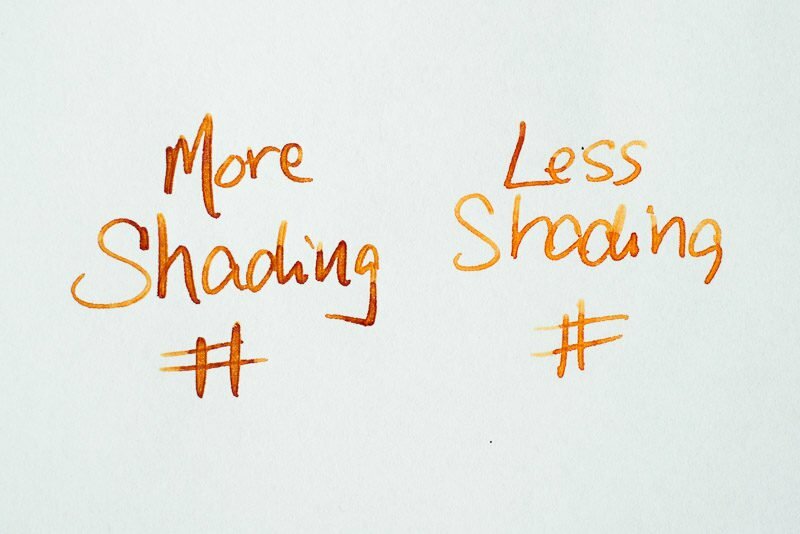 There are a few different ways you can get shading in your ink. For starters, you need to know that not all ink shades. Some ink goes down on paper in a very even line and is all the same color. This means the first step is to choose an ink that shades. Next you’ll need a pen to bring out the shading in your ink. Pens with broad or flexible nibs are usually your best bet for shading, but even fine nibs can show off the shading of some inks. Finally, the paper you choose will have some effect on the shading characteristics of your writing. A paper that absorbs ink more slowly will allow it to pool in some places, causing shading to occur. You can see in this example how using the same ink in different pens gives different amounts of shading. Just like with sheen, different combinations of ink, pen and paper will give you different results when it comes to shading. It might take a bit of experimenting to come up with a combination you love, so don’t be discouraged if you don’t get the shading you want on your first try. If shading interests you, take a look at this article for a more detailed look at how to get better shading from fountain pen ink. i never really knew what shading was until i discovered Apache Sunset. Amazing. Tell me about it. That ink shades like crazy! One of the only inks I have at the moment is Waterman Inspired Blue. That has some really nice shading to it! Using a Jinhao 159 with a Fine nib. I’ve never used that color before, but if it shades with a fine nib it must be a great shader! Nice article. In the past ink manufacturers probably tried to avoid shading and sheen, right? Not necessarily. Many old inks had great shading, although nothing as extreme as modern inks made to shade. As for sheen, I’ve found some sheen in vintage inks, which leads me to believe that it was never really “a thing” since people didn’t use slow-drying paper because they wanted paper to absorb the ink quickly so that it wouldn’t smear, which means a much smaller chance of sheen.